Even in an age of electronic registries and plastic tags, it is still essential to brand your livestock for an added security. When done correctly, it is a quick process and is essentially painless to the animal. Below are tips and tricks for branding your cattle using a firebrand, freeze brand, or electric brand. It’s important that the brand is used at the optimal temperature. A brand that is too cool will only singe the hair and disappear over time while an overheated one will cause unneeded pain and raise the risk of ruining the brand. If you choose an iron brand, you want to heat it until it becomes an ashy gray. Heating it until its glowing red is much too hot. If your brand is made of copper, look for it to turn a dull copper color. There are several options to heat your brand: using a fire, a brick oven, or with a propane bottle and burner. For a fire, dig a pit about 3 feet long, a foot wide, and 10 inches deep. Be sure your fire has a bed of coals to heat the brand on. Using a brick oven will also do the job, but because they tend to use natural gas as fuel, they may burn out brands faster than a regular fire. Finally, if you decide on a propane bottle and burner, it is recommended to use a pipe or steel drum to contain the heat. 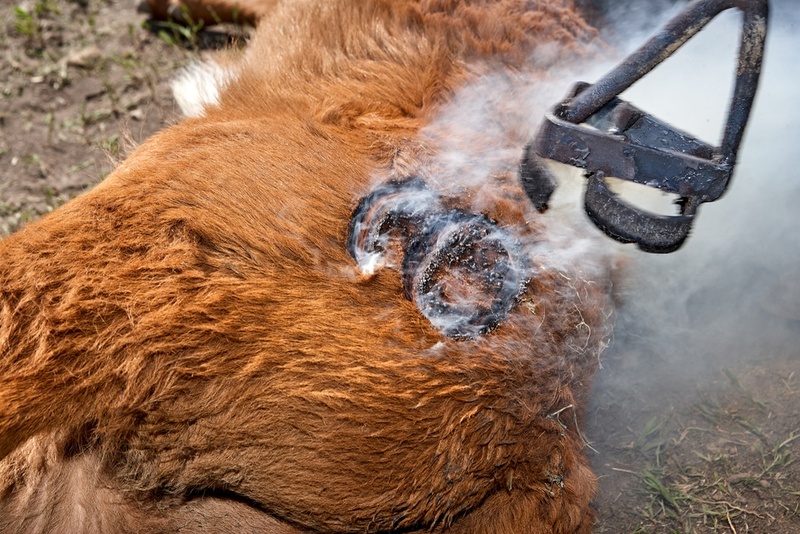 A popular alternative to fire branding, freeze branding uses an iron chilled to -160 to -250 degrees Celsius to brand the cattle by causing the hair in the branded area to grow back without any coloration. For white animals, the brand can be applied for a longer time, killing the hair follicle in that area and leaving the area permanently bald. The branding iron used for freeze branding is typically made out of a copper alloy because of its ability to hold the extremely low temperatures needed to be effective. The brand is cooled either using liquid nitrogen or a combination of dry ice and alcohol. The amount of time the brand needs to be held against the animal depends on the animal’s age, the thickness of its skin, the color of its hair, and the amount of hair between the skin and brand. Electric branding uses heat to brand cattle in the same way fire branding does, but without the need for manually heating the brand with a separate source. Electric irons use a heating element to bring the iron up to temperature, and it allows for precise temperature control for the perfect brand. Once the brand has been heated to the right temperature, its time to prepare the animal for branding. First and foremost, the animal’s hair should be dry. If the hair on the animal is longer, it might help to cut it short. Once the animal is prepped, it needs to be held as still as possible. Using a squeeze or even wrestling the animal to the ground are the most effective methods. Now that you know the best methods for branding, it’s time to order your brand. At Domer’s, we’ve been manufacturing firebrands in-house since 1926 for farmers all around the U.S., and we can also help you design your perfect freeze brand or electric branding iron. For more information on our branding irons contact us at 863-763-3417.